Office 365 has become Microsoft’s fastest growing commercial product ever, with 400% monthly active user growth and a $4.4 billion annual revenue run rate . The result is that O365 is now a core SaaS application. Many organizations rely on it to get work done, day in and day out. Consequently, IT organizations are searching for ways to make the platform easier for end users to use and easier to manage for IT. Office 365 Single Sign On, commonly known as O365 SSO within the industry, is a key part of the solution to this problem. Single sign-on has become an essential component of the IT toolbox. As employees are required to access more IT solutions, organizations must make access easy and painless for end users. A proliferation of SaaS applications has created more username and password combinations than users want to manage. A further and equally important consideration is that all of those different user accounts cause significant problems for IT. Simply put, IT has difficulty centralizing user management of those various accounts. A compromised account could result in loss of data or worse: an entry point into the core of the IT infrastructure. Single sign-on simplifies centralized management for end users and IT. Users log in to the SSO system once, and then they have access to whatever they need. The employee doesn’t need to remember various accounts and passwords. The result is less friction for end users and more control for IT. Most recently, the focus of SSO has been on web applications such as Office 365. Most of these cloud applications support the SAML protocol. As a result, it is fairly straightforward to have single sign-on access to these applications. The challenge for IT organizations is how to integrate Office 365 single sign-on with their core identity management infrastructure. Web app SSO products are not integrating single sign-on to a user’s device, their servers, LDAP applications, or WiFi network. Therefore, IT admins have to manage a core directory service and a web app SSO solution. For many organizations, that is a significant amount of overhead and cost. Luckily, there is a better way. Directory-as-a-Service® integrates the core directory services platform with single sign-on to platform applications such as O365. The benefits are that IT has one central user management platform and users have a True Single Sign-On™ solution to access the IT resources they need, including systems, applications, and networks. JumpCloud’s cloud-based directory is an excellent option for IT organizations to provision, deprovision, and modify user access to Office 365 and provide employees with single sign-on access. 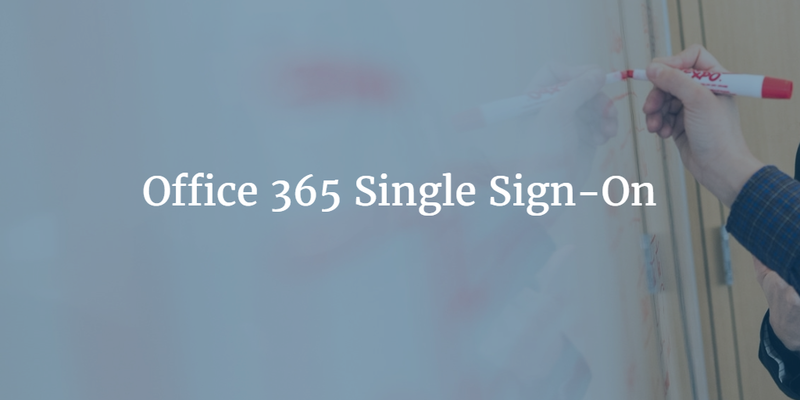 If you would like to learn more about using Office 365 Single Sign-On for your organization, drop us a note. You may be surprised to discover that you can extend the concept of SSO to all of your other IT resources as well.